Red indicates conditions that are below ideal wine storage conditions, and require the addition of moisture to the wine cellar environment in order to achieve +50% RH. Blue indicates conditions above 55° F that are likely to generate excess condensation, especially during the initial pulldown. CellarPro wine cellar refrigeration systems are designed to maintain optimal temperature and relative humidity (RH) conditions in all but the most extreme dry environments. 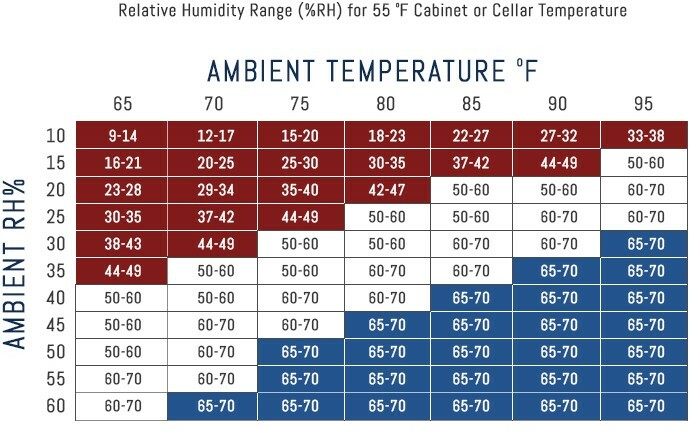 Our adjustable humidity system will work in the blue and red areas of the chart without the addition of moisture into the wine cellar environment. The chart shows the RH ranges for wine cellars using CellarPro refrigeration systems at various ambient temperature and RH levels, measured at the points of infiltration into the wine cellar. In well constructed and sealed wine cellars, the primary source of infiltration will be the door during ingress and egress.